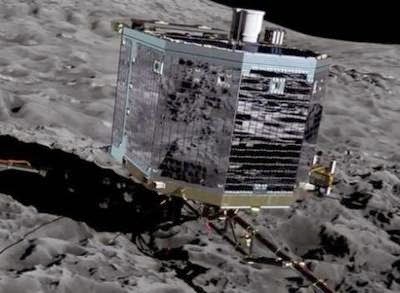 After analyzing data from Philae, scientists at the European Space Agency have detected what appears to be organic molecules on the coment 67P or Churyumov-Gerasimenko. This is a good sign because organic molecules are part of the building block of carbon based life. However. this doesn't mean that Philae found life there or anything similar. An organic molecule has one or more carbon atoms within its structure. While carbon atoms are necessary for life as we know it, many more organic molecules and compounds must be present in order to be considered life. Methane is an example of an organic compound. It has several hydrogen atoms that are attached to a carbon atom. Most likely the molecules detected are methane or methanol. If so, then these compounds would not have any relevance on how life formed on Earth. A more significant find would be that of amino acids. Nevertheless, the search continues on. Many scientists theorize that comets brought to Earth the compounds needed to allow life to evolve and form in the complex manner that it exists today. So far we know that comet 67p is mostly ice with a cover of dust and rock material similar to that of sandstone. Due to the extreme low temperature of the comet in the outer solar system, the ice is extremely solid.